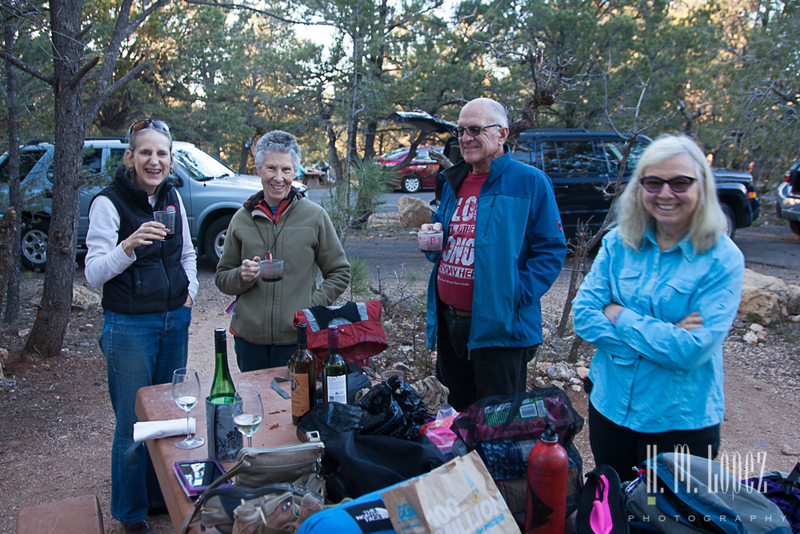 Although we lost two of our four planned nights in the canyon we still had a chance to catch up with Katherine and Erik. 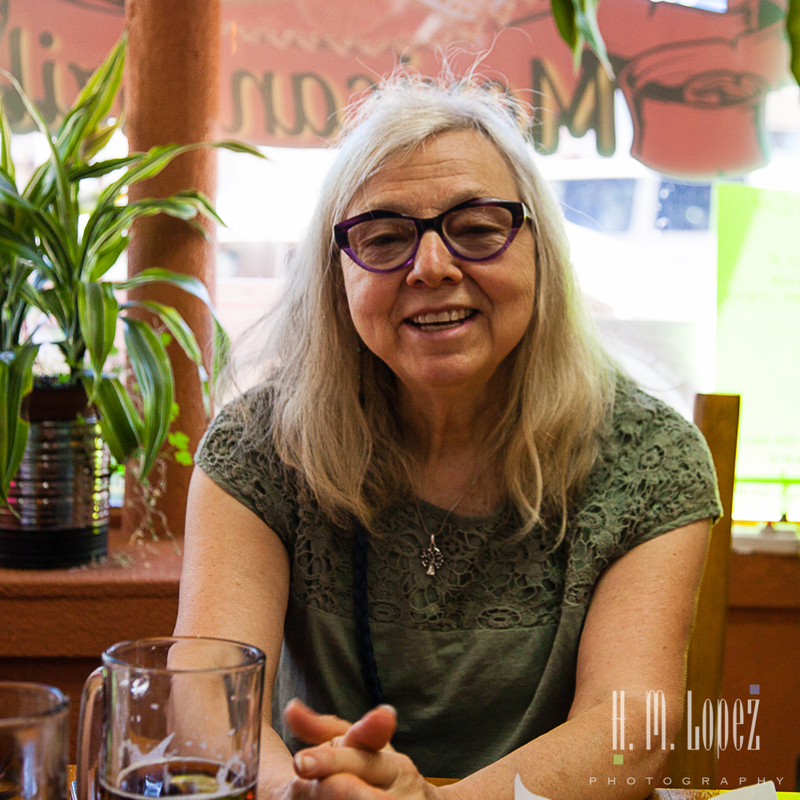 We left Congress and met them in Williams, Arizona where we had a nice leisurely Mexican lunch with them and their friend, Nath, one of the group that was backpacking that week. 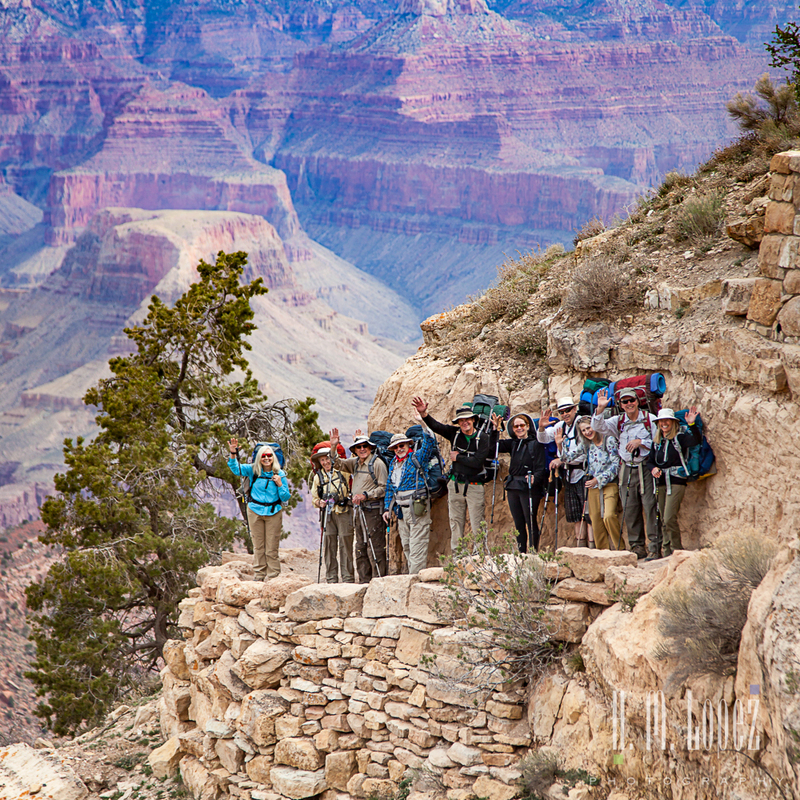 Then we all continued to the Grand Canyon, they took off to join the rest of their group at their campsite, and we went in search of some National Forest land that we could boondock on. We found a spot in Forest Service Road 302 just outside the park entrance. Check out my review of this boondocking spot here. Later that evening we joined them at their group campsite. 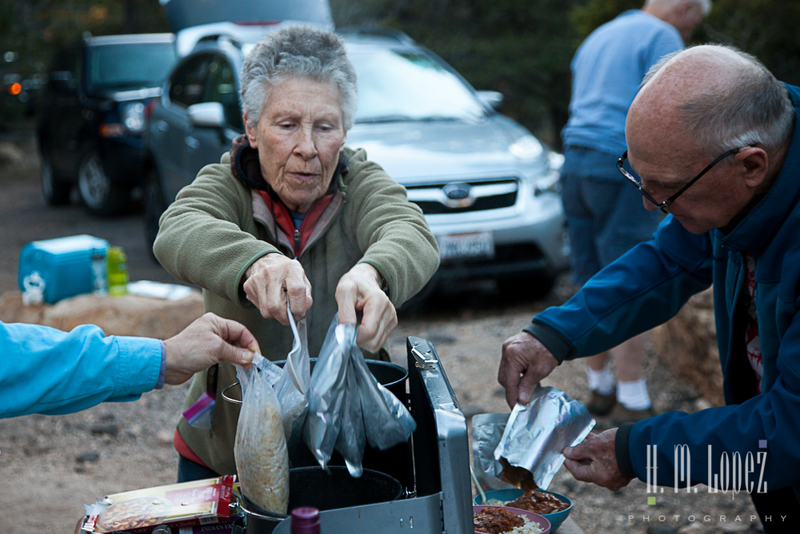 The group was having an early dinner and preparing for the morning. We enjoyed some wine together. Then Hector took some group shots. 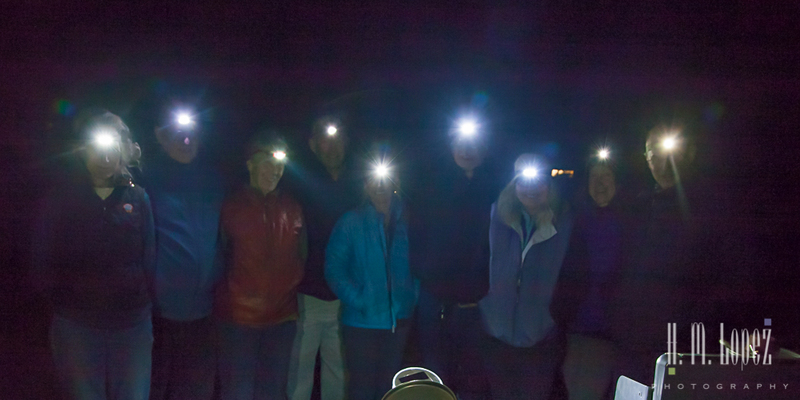 We got quite caught up in the excitement of the group and made a plan to meet them in the morning at their trailhead to see them off and for more photo opportunities. But of course, Hector wanted to catch the sunrise on the canyon. 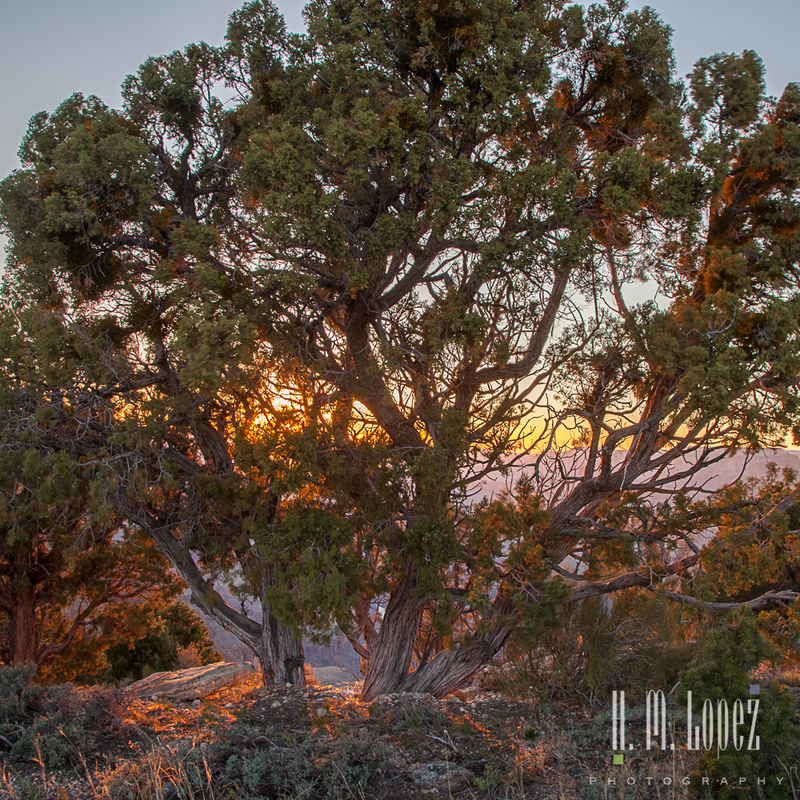 And since we had Angel with us, we chose Yavapai Point for the sunrise. Fortunately, the rim trail that goes along from there to other points allows dogs. 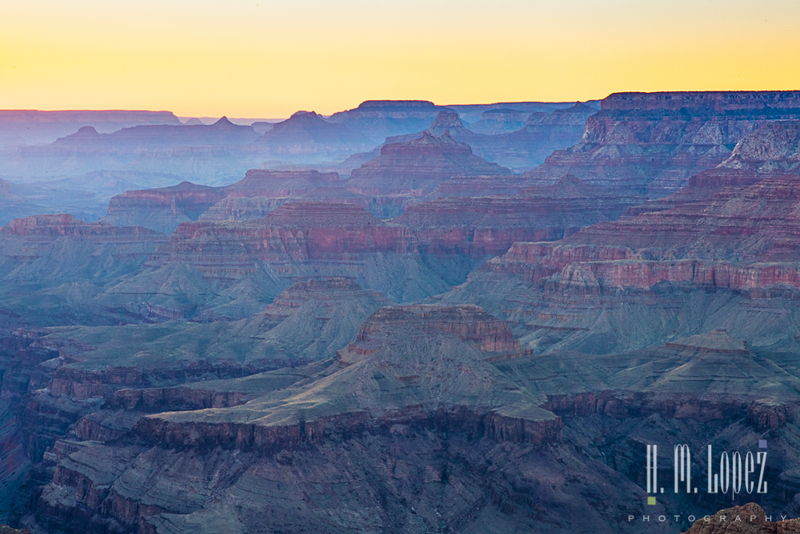 It was a beautiful sunrise, the Grand Canyon is one of those places that takes my breath away no matter how many times I have seen it. 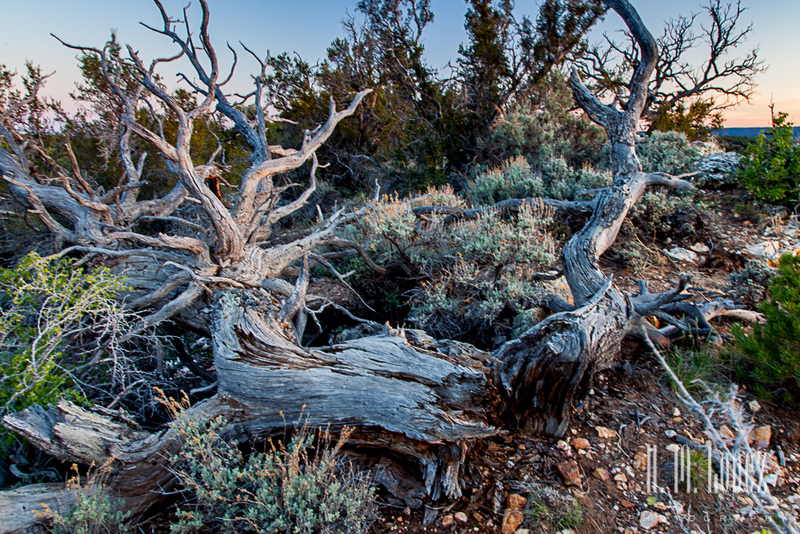 We walked along the rim trail for a bit and checked out various views. 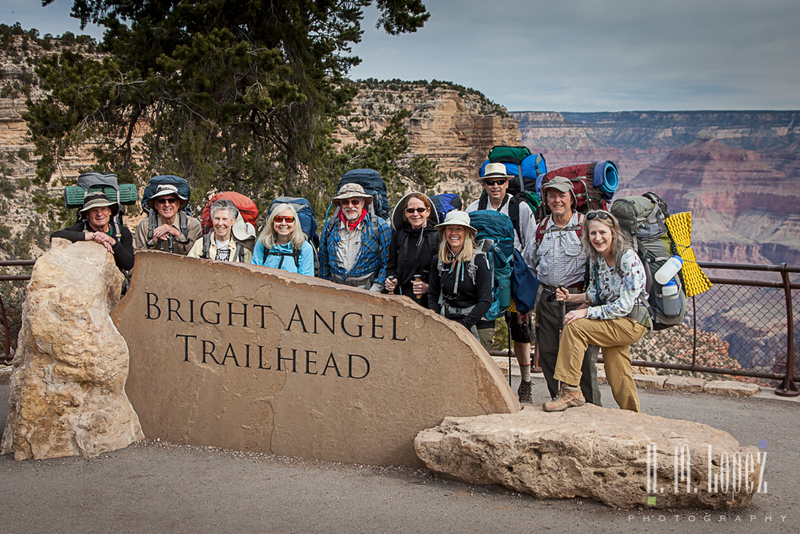 Then we drove to the Bright Angel trailhead to meet the gang. 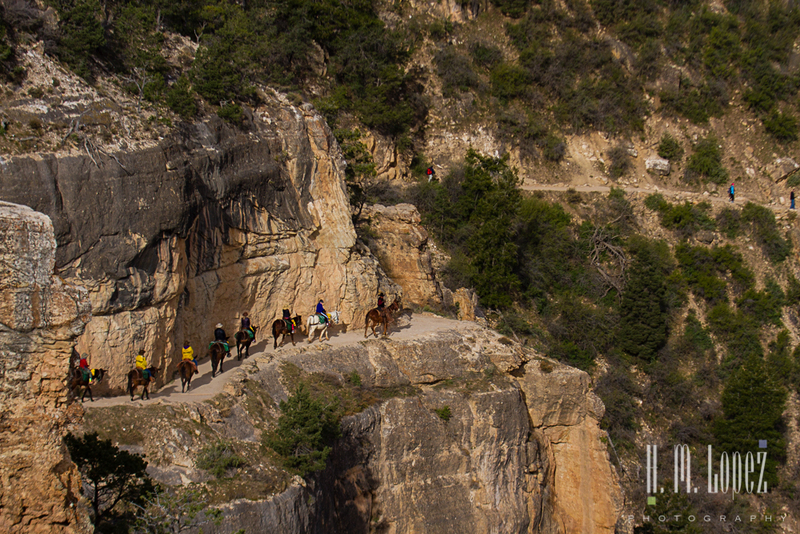 While there, we watched as a group of tourists prepared to head down the trail on mules. 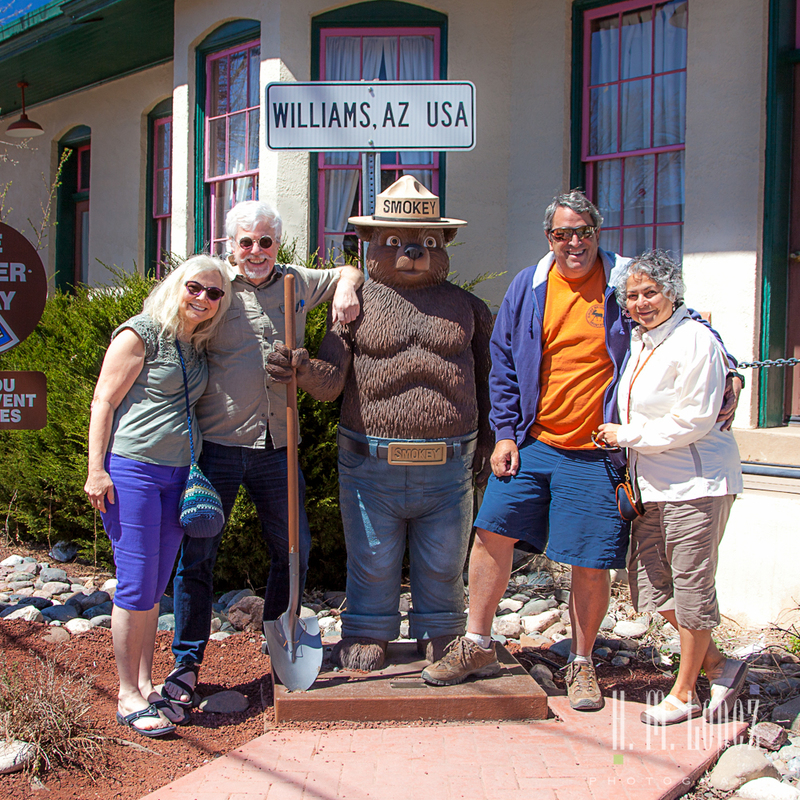 This is a very popular tour – one day they head to the bottom on the mules, have dinner and overnight at the Phantom Ranch, and head up the next day. I have to confess that I would freak out if I had to ride a mule down the Grand Canyon, but lots of people seem to enjoy it. We also watched the hikers and backpackers hiking down the trail, I must admit I was a little jealous. Finally our friends arrived, they were running a bit late, but Hector had scoped out a couple of places for photos already. He was able to take some quick group shots before we parted ways. We watched the group hiking down the trail for awhile, a bunch of happy campers off on a big adventure. 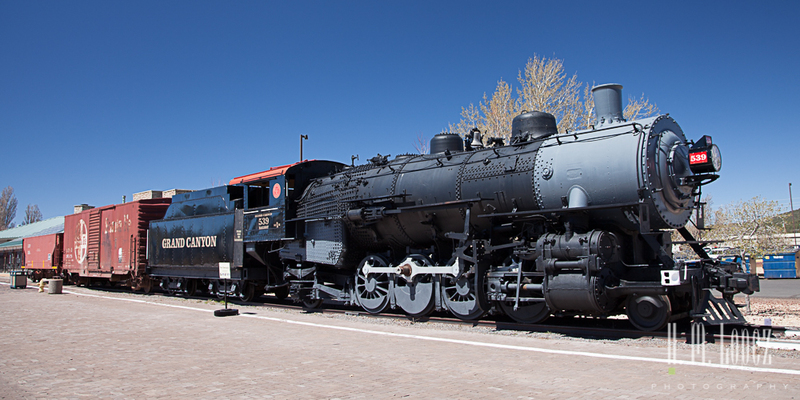 Then we took a short drive around the canyon, made a quick stop at the Visitor Center and went home to Island Girl. Of course, we drove back out prior to sunset for more photography. 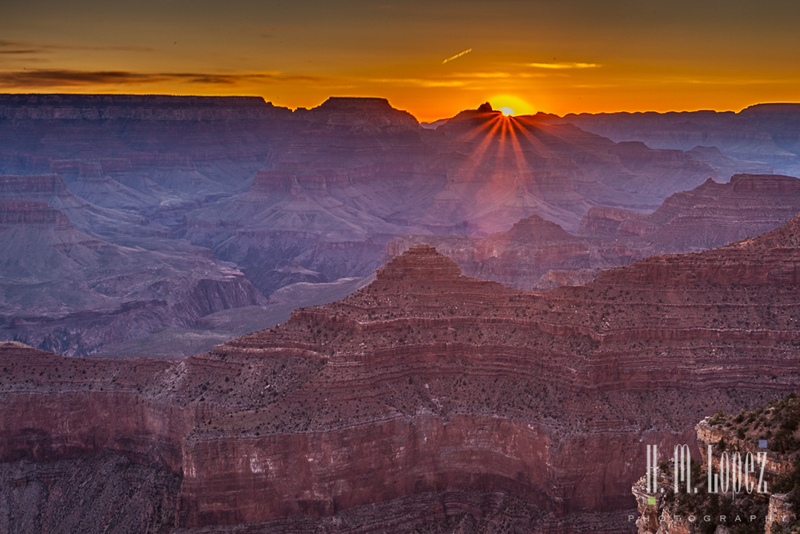 Apparently, there is a vigorous debate as to whether sunrise or sunset is best for photography in the Grand Canyon. And we have the answer – both are spectacular! 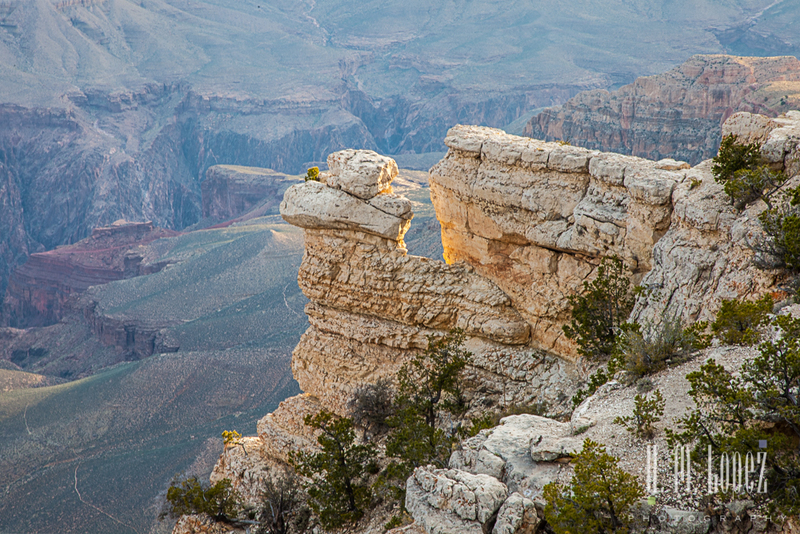 We spent the afternoon and evening stopping along the overlooks on the east rim drive. One view as amazing as the next. 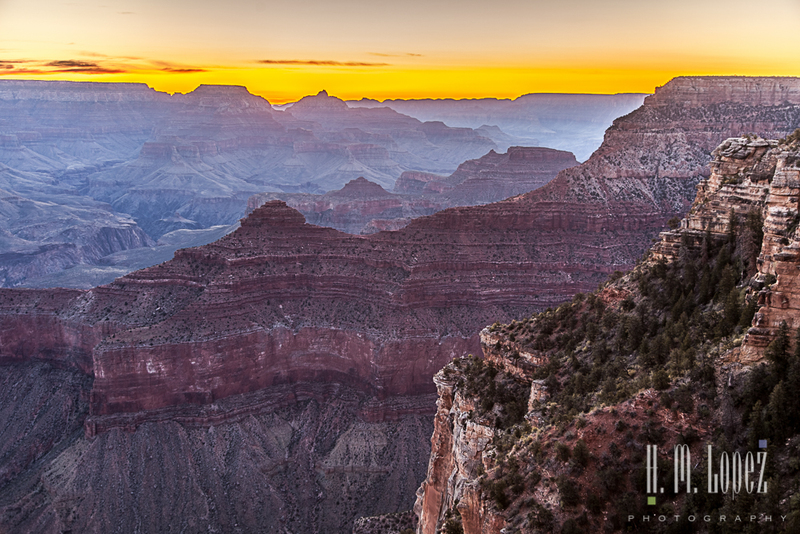 We enjoyed the beautiful sunset at Lipan Point. 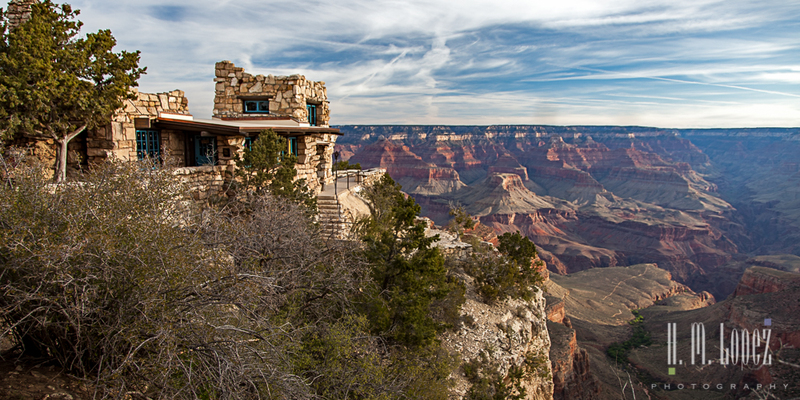 It was a great day in the Grand Canyon but we had to leave the next morning. Why did we cut our stay so short? Hector had a very specific photography goal in mind and we had to get to that destination before the new moon. All will be revealed in the next post. 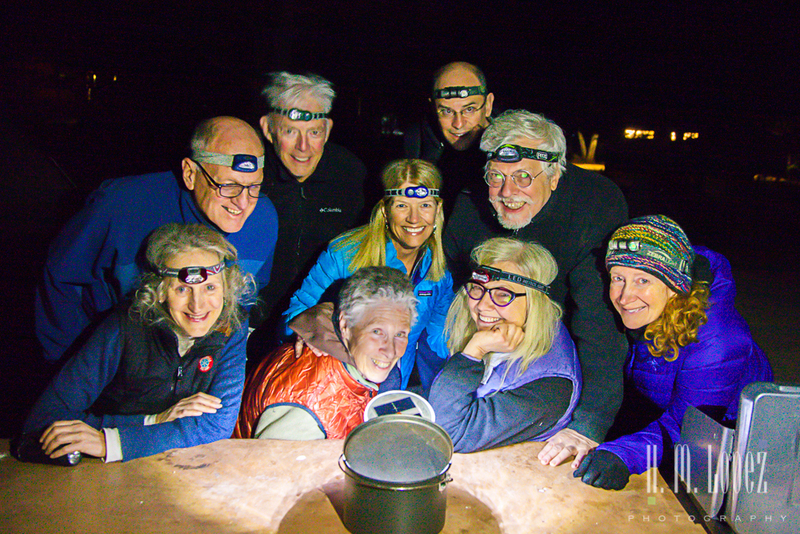 This entry was posted in Arizona, RV fulltimers, States Visited and tagged boondocking, cliffs, desert, dry camping, friends, national parks, sunrise, sunsets by islandgirlwalkabout. Bookmark the permalink. Beauty beyond imagination. My first visit was last May and it snowed, hailed, rained and shined on us. Lovely weather for photographing. Glad you had clear weather! We were so lucky to have just one day and for the weather to be so great. It must be beautiful there after a snow, although you don’t want to be in the midst of the storm. 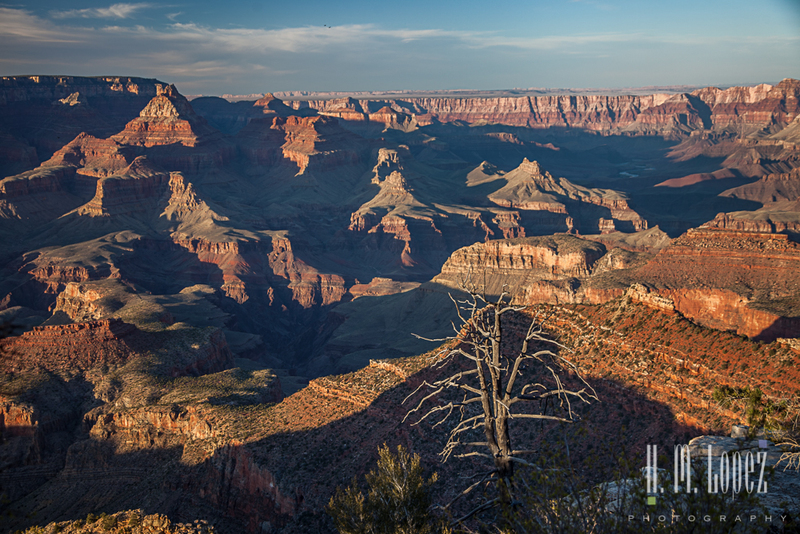 Beautiful shots of the sunrise and sunset with the long shadows to highlight the colors of the canyon. Wow, up and back sounds like a tough hike. Hector hiked down and stayed overnight once. I hope to do that one day as well. Even though your visit was short, you got some beautiful pictures! 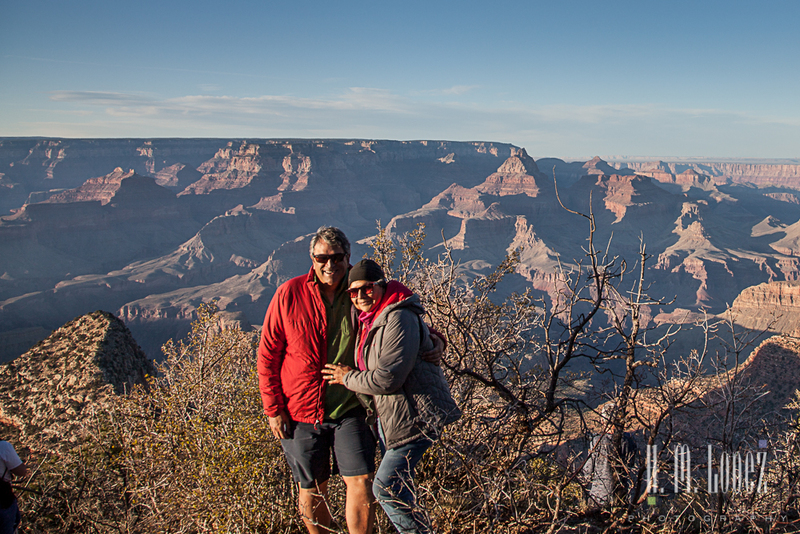 Our first visit to the Grand Canyon was also just a quick one. We drove there and back from Phoenix in one day. I hope to spend more time in the future. Thanks! It is worth spending some quality time, every day has different possibilities. You captured it so beautifully! And all in one day too! Wonderful! Thanks, Nina, it was quite a day. How neat to get to see your friends off with the group! 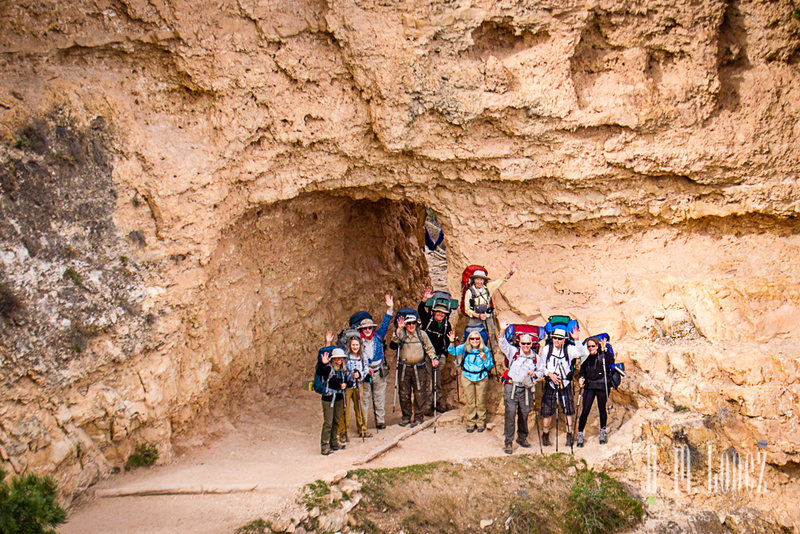 Love all the group photos as they were beginning their descent…happy hikers for sure:) They probably don’t have such memory keeper photos. 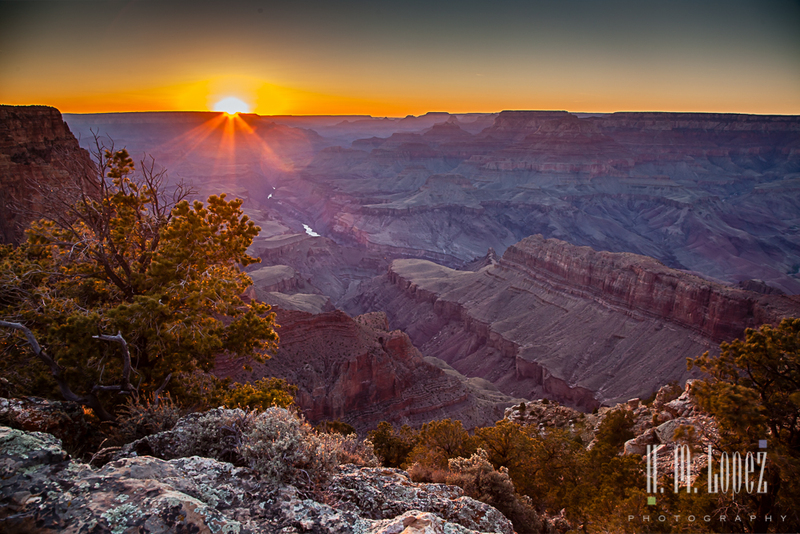 Beautiful and spectacular photos as the canyon begins and ends of the day!! It was a great day and a great group, we were really happy with the group shots. 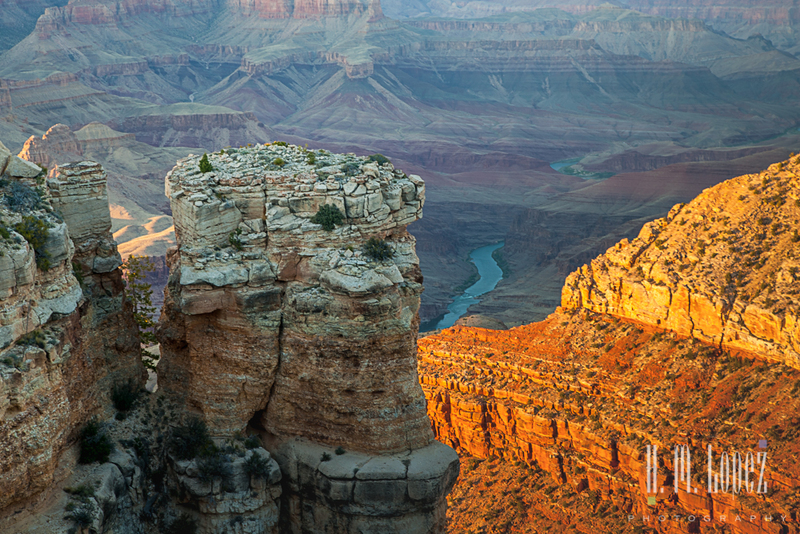 I once took a helicopter ride into the Grand Canyon – it was breath taking! Love your photos and glad Ingrid (live laugh rv) sent me this way. Welcome! I imagine a helicopter ride would be an amazing view of the canyon. It is such a beautiful place. Funny. 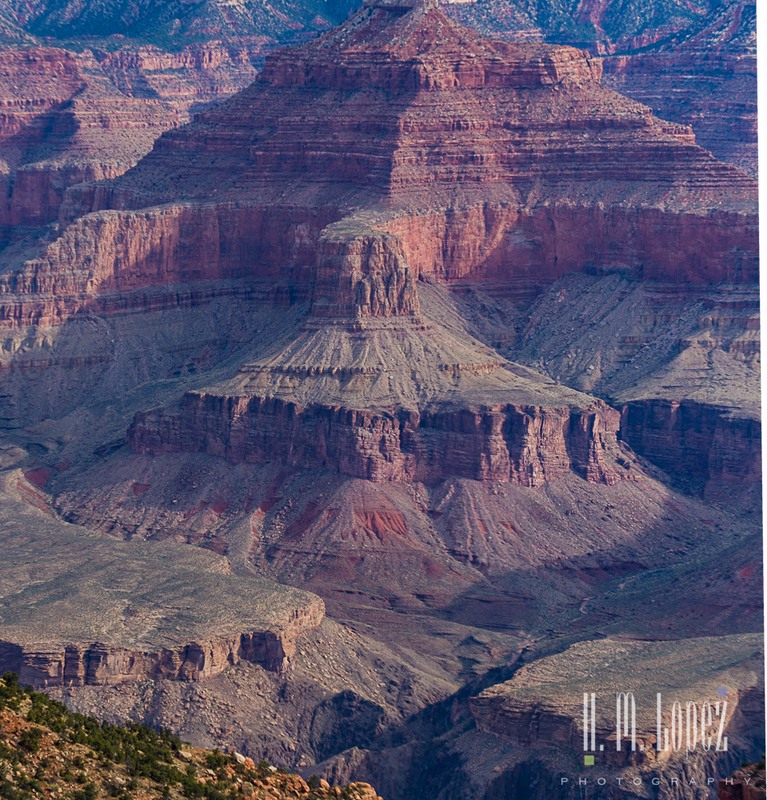 I cannot believe you haven’t been to the Grand Canyon, but glad it’s on your list. See you this summer. 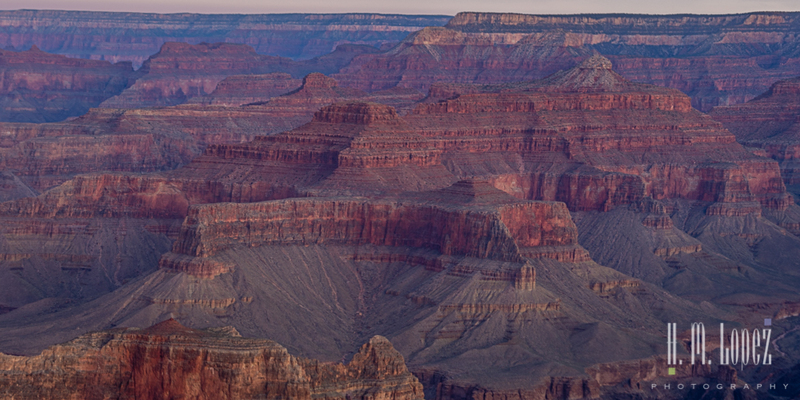 I’m with you Brenda, no matter how many times I have been to the Grand Canyon, I never tire of the beauty. 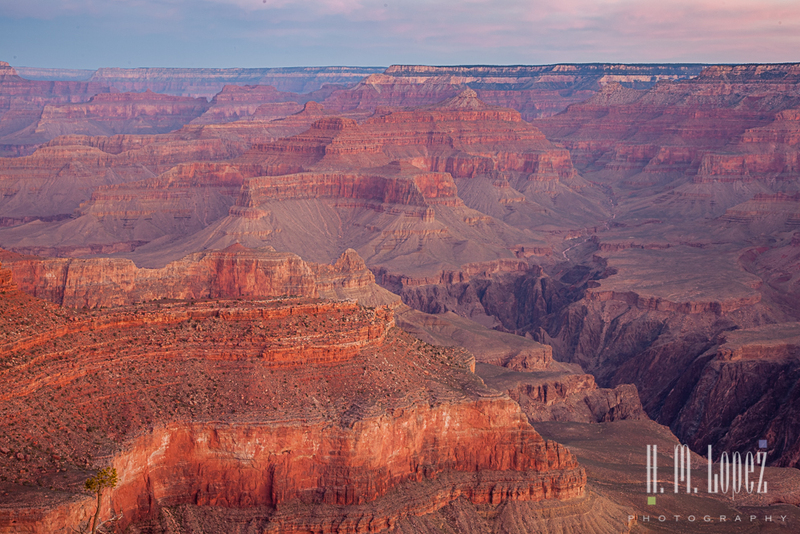 And Hector’s photos speak to the grandeur of the canyon. How wonderful to be able to see your friends off on their grand adventure! 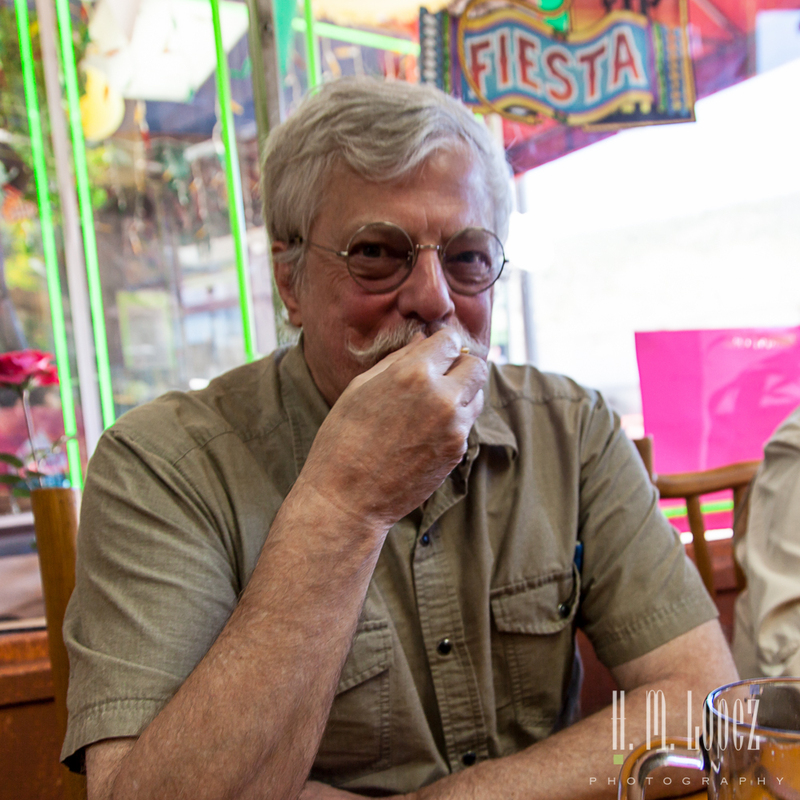 It was so fortunate that we were able to meet, and seeing the canyon even for a day is wonderful. How magical! I got get there someday! You must! A great subject for a painting. The Grand Canyon is very hard to photograph with the shadows and haze, winter would probably be a better time, pity it’s so cold! 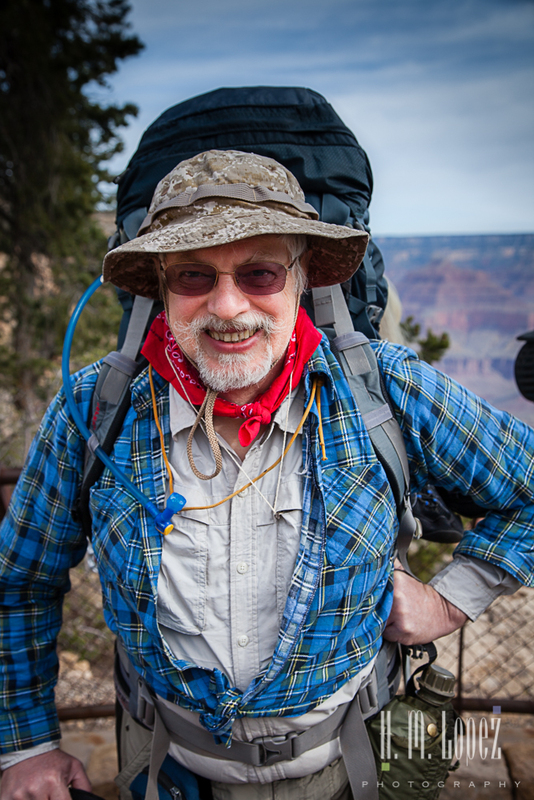 Hector has photographed the Grand Canyon on a couple of different trips, and it has many different “looks”. I have seen some beautiful photos of National Parks in the snow, one day we will visit, but not in the motorhome.